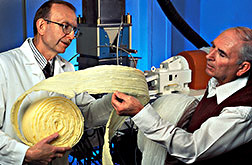 At the National Center for Agricultural Utilization Research, ARS chemist George Fanta (left) and Don Fisk, president of Uni-Star, Inc., examine foam packing material extruded from biodegradable cornstarch. When Peter Pan sewed his shadow onto the soles of his feet, he was amazed that the shadow followed him everywhere he went. And now, 23 years after Agricultural Research Service (ARS) biochemist Bill Doane and coworkers first attached a synthetic polymer to starch molecules, they and others in science and industry are still amazed at the impact this piece of basic research technology has had on U.S. rural development and the broadest range of consumers. Doane's discovery—called Super Slurper—is capable of absorbing hundreds of times its own weight in water. Based on a grafting technique pioneered by ARS chemist Charles Russell in Peoria, Illinois, Super Slurper "married starch and synthetic polymers," as Doane explains it. Super Slurper has found commercial life over the years in products as varied as seed coatings, wound dressings, automobile fuel filters, and plastic mesh barriers used at construction sites. Joining Doane on the Super Slurper development team were ARS researchers Mary Ollidene Weaver, Edward B. Bagley, and George F. Fanta. Super Slurper netted the team the Inventor of the Year Award from the Association for the Advancement of Invention and Innovation in 1976, the year they also shared USDA's Distinguished Service Award. Doane led plant polymer research at ARS' National Center for Agricultural Utilization Research (NCAUR) at Peoria for a decade, beginning in 1984. He retired from the agency in January of 1995 and, in November, was inducted into ARS' Science Hall of Fame—the research agency's highest honor for contributions to agricultural research. Doane is now employed by Bradley University in Peoria, working under an agreement with the Biotechnology Research and Development Corporation, which is funding the continuation of one of Doane's research projects started at NCAUR. During his years with ARS, Doane led research that has yielded the technology behind a host of products. These include thickening agents, absorbents, starch-encapsulated pesticides, starch xanthate for recovering heavy metals from waste water, and natural components for making degradable plastics. "More than products, Doane's transfer of starch modification technology to commercial use has created and continues to create new markets for millions of pounds of cornstarch," says Richard L. Dunkle, director of ARS' Midwest Area. "A few projects are still ahead of their time, such as degradable plastics, but current research is chipping away at some of the barriers that have slowed down their commercialization." 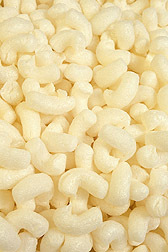 Biodegradable loosefill packing material is 95 percent starch and 5 percent synthetic polymer. For much of his career, Doane worked on products and processes that had the potential to be commercialized. Some of them made it, and others didn't. Born in 1973, its scientific name—saponified starch-graft polyacrylonitrile copolymers—was too cumbersome to catch on with anyone outside the scientific community. The name "Super Slurper" was coined by Dean Mayberry of ARS' Information Office. The name change, coupled with publicity, stimulated thousands of inquiries, and a multimillion-pound market for the polymer was projected. In 1975, the polymer and its inventors received the IR 100 Award from Industrial Research Magazine. ARS granted about 40 nonexclusive licenses to make, use, or sell the absorptive polymer. As soon as these licenses were granted, Doane and other scientists at NCAUR began working actively with the licensees, providing information on the polymer's properties and how to process it. "The products and processes created by Doane and other Peoria scientists caught the interest of the private sector," says Peter B. Johnsen, NCAUR director. "Even more than the licenses that were granted to companies using our patented technology were the many other patents developed by the companies to extend the technology. Still, the inspiration and basic science for technologies used in absorbent products such as disposable diapers came from this ARS research." Other factors have evolved historically to help increase the chance ARS scientists like Doane can have a role in getting laboratory research into the marketplace—a step that is vital to ensuring a steady flow of new uses for farm products. The legal factors influencing technology transfer 25 years ago were entirely different from those existing today. Although ARS has always encouraged scientists to file patents and companies to license them, the agency was then limited to granting only nonexclusive licenses to businesses. So, before 1980, both government and industry leaders traveled a rocky road from research to product development. Federal researchers were obligated to offer their technology to everyone who asked for it. "We were unable to grant exclusive licenses for our patented inventions," says Johnsen. "That meant that no company could have the exclusive right to market—and protection while recovering the cost of developing—new-use technologies resulting from government-funded research. As a result, companies that competed with one another had no incentive to make significant financial investments to commercialize ARS technologies." Even with the disincentive of nonexclusive licensing, Bill Doane firmly believed in product development. He always listened carefully as visitors from agribusiness discussed research and product development. He challenged his research team to come up with creative ideas to solve their problems. When moistened, a flake of Super Slurper captures more than 1,400 times its own weight in water. The potential for commercialization of agricultural research began to blossom in 1980, when the Stevenson-Wydler Technology Innovation Act—an amendment to the U.S. Patent and Trademark Laws—gave federal laboratories the authority to grant exclusive patent licenses to private industry. "ARS quickly exploited this authority, and our technology transfer activity increased," says Johnsen. The Technology Transfer Act of 1986 encouraged the agency to enter into cooperative research and development agreements (CRADA's) that supported ARS-industry partnership. A CRADA provides a framework for collaboration between ARS and a partner and gives the cooperating company the first chance at exclusive licenses to use technology that emerges from the joint effort. "This legislation formally changed our approach, as the private sector became much more interested in our ability to cooperate," says Johnsen. In spite of the nonexclusive licenses that were granted on the Super Slurper technology, a few companies were formed solely to produce the polymer. One of these was Super Absorbent Co. of Lumberton, North Carolina. Super Absorbent founder Ed Kirkland read about Super Slurper in a 1975 issue of Agricultural Research magazine and contacted Doane. In 1978, Kirkland began marketing Ag Sorbent, a polymer mixture that keeps tree roots moist until trees are replanted. His clients include the growers of North Carolina's 30,000 acres of Christmas trees. Super Absorbent's latest endeavor is a turkey feed containing microbes suspended in a polymer mix. The polymer provides moisture to sustain the microbes, which in turn will potentially help turkeys fend off disease. "Not all the microbial blends we make use the polymer originated by ARS, but I never would have gotten into the microbe work without the information provided by Doane, Roger Eisenhauer, and George Fanta" at the Peoria facility, Kirkland says. He reports that gross sales of several of his company's products now exceed $500,000 annually. Don L. Fisk, president of Uni-Star, Inc., also praises Doane and other scientists at the Peoria research center. Uni-Star began in Canton, Illinois, but has relocated to Memphis, Tennessee, for easier access to bulk quantities of cornstarch slurry from Cargill, Inc.
Absorbent products such as disposable diapers are a result of ARS’ ongoing starch-utilization research program. A former farmer, Fisk realized corn had other uses besides feed for hogs. Still, "I probably wouldn't be in this business today if it weren't for the support and guidance I got from Bill Doane and George Fanta. They helped enable us to make large quantities of the starch-acrylic polymer," says Fisk. In 1992, Uni-Star began large scale testing with a Minnesota firm, demonstrating that the polymer could be blended with starch and made into a resilient, loosefill packaging material—the familiar "packing peanuts"—with degradable characteristics. Today's U.S. packaging market could easily use about 254 million pounds of starch annually. "This success sparked my interest in studying other end-use applications for the Super Slurper polymer," Fisk explains. When large-scale testing began Doane and Fanta were regular visitors at Uni-Star's facility 30 miles west of Peoria, meeting with Fisk and his employees to help solve the problems of polymer processing and marketing. After observing firsthand Fisk's preparation and processing steps, the scientists suggested ways to improve the work and the quality of the end products. Uni-Star now produces 20,000 pounds of starch graft copolymers per week and sells them for loosefill. Fisk's goal is production of a half million pounds per month—with potential monthly gross sales of $350,000. 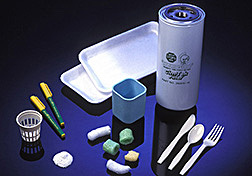 Since June of 1995, Fisk has been working under a letter of intent with Rapac, an Oakland, Tennessee, company that produces 60 percent of the polystyrene loosefill in the United States. Fisk says, "Because of Bill Doane's and George Fanta's support and technical advice, I was able to file two U.S. patents on technology and improvements on the original work that came out of NCAUR. "I'd have given up long ago without their help and expertise," Fisk adds. "I'm still in contact with George, who is helping me with plastic film development." When Doane and his research team began working on degradable plastics and products based on controlled release technology, such concepts were ahead of their time. But as market demands and concern for the environment increase and production costs decline, more of these products are finding their way into the marketplace. "People don't realize that it isn't easy to develop a product or change an industrial process. Every day is a slugfest; there's always Murphy's law to contend with in the real world," says Steve Ayers, vice president of sales marketing for Central Illinois Manufacturing Company in Bement. Ayers' parents founded Central Illinois Manufacturing in 1956. During the mid-1980's, the Ayers family manufactured Hydrosorb, a Super Slurper-based fuel filter media for service station gas pumps. Though Ayers says they have since switched to a synthetic polymer, "ARS research findings and the invaluable support Doane and Fanta gave us helped make us a leader in the filtration field." Another fan of Super Slurper is Ray Mullikin, technical sales representative for Grain Processing Corporation of Muscatine, Iowa, which was among the first companies to license the technology. Products shown contain from 25 to 100 percent biodegradable cornstarch—except for the filter, which has a water-absorbing cornstarch polymer component. Grain Processing Corporation's superabsorbent, called WaterLock, is sold to cosmetic and pharmaceutical manufacturers throughout the world. WaterLock superabsorbent polymer is a component of microbial biological control agents—as well as an ingredient in turf mats. Getting research off the federal shelf can create new job opportunities. Just ask Richard R. Tryon, president of Agri-Tech Industries at Champaign, Illinois. After 31 years as a printer and publisher, Tryon decided to try his hand at making degradable, starch-based plastics for American industry. 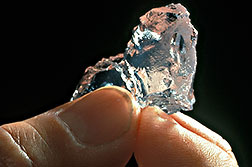 Tryon's inspiration came from ARS chemist Felix Otey, who, under Bill Doane's leadership, discovered that blending cornstarch, an acrylic acid polymer, and polyethylene would form a degradable plastic film. The invention was patented by USDA and licensed by Agri-Tech in 1986. "Bill Doane supported and encouraged us when we were first getting started. He gave freely of his time and resources," says Tryon. It's just as easy to find fellow scientists at the Peoria research center who admire Bill Doane. He is known as the kind of research leader who "taught us to care and focus on what we were doing," says Rodney Bothast, who is now leader of fermentation research at NCAUR. "Bill encouraged us to follow through with our work. And he always used a great deal of common sense in his approach to people and to research." Doane is also remembered for letting fellow scientists enjoy the limelight, according to ARS coworker Baruch Shasha, a friend and colleague since the two attended graduate school together at Purdue University in West Lafayette, Indiana. "He genuinely enjoys seeing others succeed and win, even if it means a smaller role for him," says Shasha, who joined the NCAUR Plant Polymer Research Unit in 1963. Doane's winnings are the fruits of his agricultural research—a benefit to American consumers, as well as to industry, says area director Dunkle. "While the products that resulted from his research merit our admiration, so too do the larger goals he achieved: a cleaner environment, more jobs for people, and new markets for hundreds of millions of pounds of cornstarch." — By Linda Cooke, ARS. "One Team, One Product -- Many Uses" was published in the May 1996 issue of Agricultural Research magazine.